Abstract. 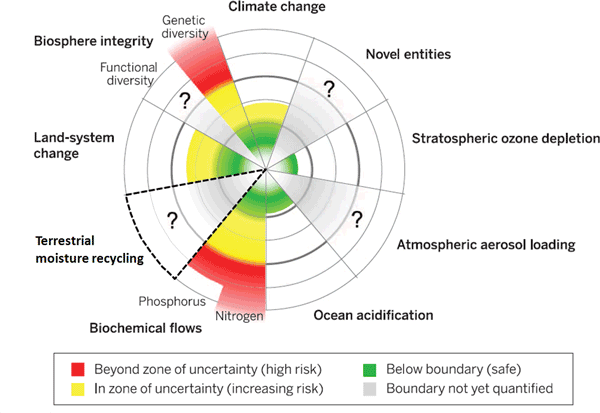 In 2009, a group of prominent Earth scientists introduced the planetary boundaries (PB) framework: they suggested nine global control variables, and defined corresponding thresholds which, if crossed, could generate unacceptable environmental change . The concept builds on systems theory, and views Earth as a complex adaptive system in which anthropogenic disturbances may trigger non-linear, abrupt, and irreversible changes at the global scale, and push the Earth system outside the stable environmental state of the Holocene . While the idea has been remarkably successful in both science and policy circles, it has also raised fundamental concerns, as the majority of suggested processes and their corresponding planetary boundaries do not operate at the global scale, and thus apparently lack the potential to trigger abrupt planetary changes. This paper picks up the debate with specific regard to the planetary boundary on global freshwater use . While the bio-physical impacts of excessive water consumption are typically confined to the river basin scale, the PB proponents argue that water-induced environmental disasters could build up to planetary-scale feedbacks and system failures. So far, however, no evidence has been presented to corroborate that hypothesis. Furthermore, no coherent approach has been presented to what extent a planetary threshold value could reflect the risk of regional environmental disaster. To be sure, the PB framework was revised in 2015, extending the planetary freshwater boundary with a set of basin-level boundaries inferred from environmental water flow assumptions. Yet, no new evidence was presented, either with respect to the ability of those basin-level boundaries to reflect the risk of regional regime shifts or with respect to a potential mechanism linking river basins to the planetary scale. So while the idea of a planetary boundary on freshwater use appears intriguing, the line of arguments presented so far remains speculative and implicatory. As long as Earth system science does not present compelling evidence, the exercise of assigning actual numbers to such a boundary is arbitrary, premature, and misleading. Taken as a basis for water-related policy and management decisions, though, the idea transforms from misleading to dangerous, as it implies that we can globally offset water-related environmental impacts. A planetary boundary on freshwater use should thus be disapproved and actively refuted by the hydrological and water resources community. How to cite: Heistermann, M.: HESS Opinions: A planetary boundary on freshwater use is misleading, Hydrol. Earth Syst. Sci., 21, 3455-3461, https://doi.org/10.5194/hess-21-3455-2017, 2017. 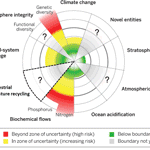 In 2009, the "planetary boundaries" were introduced. They consist of nine global control variables and corresponding "thresholds which, if crossed, could generate unacceptable environmental change". The idea has been very successful, but also controversial. This paper picks up the debate with regard to the boundary on "global freshwater use": it argues that such a boundary is based on mere speculation, and that any exercise of assigning actual numbers is arbitrary, premature, and misleading.